When I saw this, I used a raincheck pass given to me by my theater so I can see one movie for free. After it was over, I thought to myself "Damn, I should've used that pass when I saw Minions!". Straight Outta Compton tells the real life story of the controversial rap group N.W.A. and their rise to fame as well as the struggles they have faced from both within and those that have tried to silence their artistry. What is so unique about this film is that even though it has some typical conventions of the musical biopic (band rises to fame then slowly falls apart), it still didn't really feel like a biopic. It does demonstrate the accomplishments of the members of N.W.A. yet at the same time, it still manages to convey how in terms of both race relations and freedom of artistic expression, nothing has changed. Even though our first amendment gives us the right to say what we want, there are still artists that are trying to be put in a box like how they tried to censor N.W.A.. But while the lyrics of their songs are laced with profanity, they were mainly trying to get their point across about police brutality and life in the ghetto. The film is like two rolled into one. The first one, or the first half, delves into the rise of N.W.A. as well as the artistry behind the music. But the second half, which deals with (*possible spoiler alert*) life after N.W.A., goes deep into the business side of the music industry as well as how the members of the group achieved fame and greatness yet at a certain cost. Some of my favorite scenes were some of the earlier ones where the band is recording music and performing together. As Ice Cube and Easy E are rapping, they put so much fire and spirit into the way they rap, that it makes each scene both raw and entertaining. It is mostly due to the actors playing them which brings me to my next point. 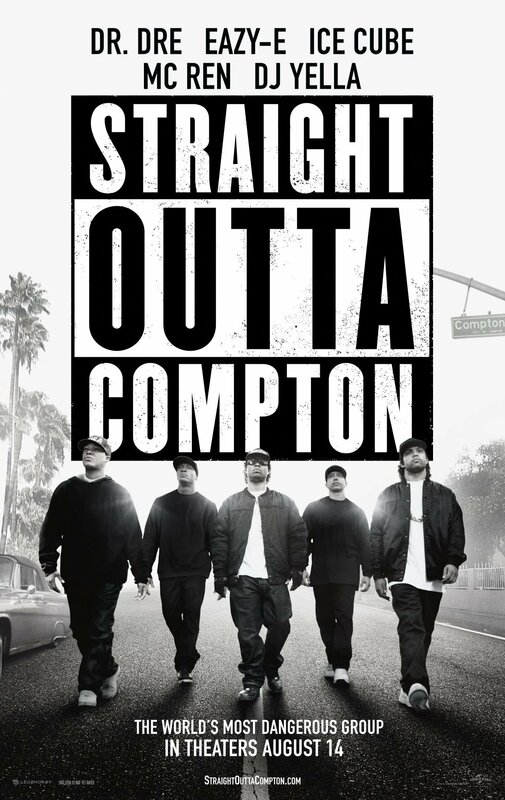 I thought the three main actors: Corey Hawkins as Dr. Dre, O'Shea Jackson as Ice Cube, and Jason Mitchell as Easy E, were tremendous. One thing I loved about their performances was how, since they are playing real-life people, they weren't trying to do a complete imitation of the people they were portraying because that is something that often plagues biopics where the actor puts so much emphasis on the mechanics of the role, it becomes a technical mastery but not much else. While I thought Corey Hawkins and O'Shea Jackson were very charismatic and brought their roles to life, in my opinion, the MVP of the trio was Jason Mitchell. He commands the screen as Easy E and captures both his lively rapid-fire rap style and his opportunistic demeanor with 'ease'. He is funny, sympathetic, and also heartbreaking. I hope that he, along with Hawkins and Jackson, goes places after this movie. I also loved the small cameo by Keith Stanfield as Snoop Dogg. He's another one on his way up. Overall, Straight Outta Compton is a successful biopic that uses the conventions of its genre to a great advantage as it mixes the life story of the group it portrays with a portrait of how our nation is today. Even if it has a similar formula, it is done in a way that doesn't appear formulaic. One of the best movies of the year. Absolutely. Even if you aren't a fan of rap or N.W.A., give this one a chance.